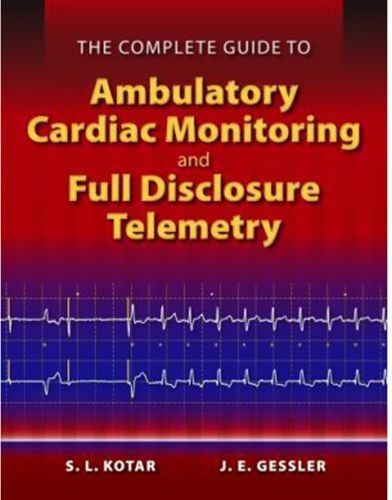 The Complete Guide to Ambulatory Cardiac Monitoring and Full Disclosure Telemetry is a one-of-a-kind text designed to educate health care practitioners on the accurate and precise interpretation of output data from ambulatory monitoring devices. This invaluable resource offers practicing physicians, residents, medical students and telemetry-monitoring technicians a first-ever instructional guide to detecting the often minute waveform anomalies presented by full disclosure EKG testing and Holter monitoring in patients with cardiac arrhythmias. Through detailed EKG graphics and readily accessible content written from the physiciana (TM)s perspective, The Complete Guide to Ambulatory Cardiac Monitoring and Full Disclosure Telemetry covers a wide range of signatures associated with arrhythmias, including heart blocks, wide QRS rhythms and ventricular tachycardia, as well as information on cardiac devices such as pacemakers and ICDs. The Complete Guide to Ambulatory Cardiac Monitoring and Full Disclosure Telemetry is an essential resource, enabling physicians to efficiently analyze intricate EKG data with confidenceA-a "and to make assured, and correct, medical evaluations.